Although I am fairly new to photography, I am familiar with the inverse square law. This law states that if you double the distance of the light source from your subject, the subject will receive only a quarter of the amount of light he was getting originally. You'll have to open up your aperture two stops, rather than only one stop, to get the same exposure, even though you only doubled your distance. As an example, My flash is at full power five feet away from the subject, and the subject is five feet away from the background. If subject meters at f/8, the inverse square law dictates that the background will meter at f/4. Here's my diagram (each dash represents one foot). My question is, if the light is made larger, such as by adding a softbox (obviously compensating for the softbox by increasing the flash power until I get f8 at five feet again), will the background now meter at less than f/4? Will the falloff be faster because the light source is larger? The reason I think this is true, is because when you increase the APPARENT size of the light by bringing it closer to the subject, the falloff is faster. Is this also true when you increase the ACTUAL size of the light, without moving it closer? If you increase the size of the light source, and you don't change anything else, then the light fall-off is adjusted by the intensity of the larger light source. A possible reason the light falloff appears to be more severe by moving the light source closer to the subject is because, the subject is blocking a lot of the light from the source. There is less remaining light reaching the background which is behind the subject. stephen u said "If you increase the size of the light source, and you don't change anything else," did u mean u dont even change the power of the light to get the same exposure at 5 feet like shulim said? I will read your link soon. Naftoli, Stephen is saying that you only increase the size, such as by using a bigger flash. not by introducing a light modifier. so he will still get the same exposure. in my scenario above, I had to increase the power because I used a softbox. 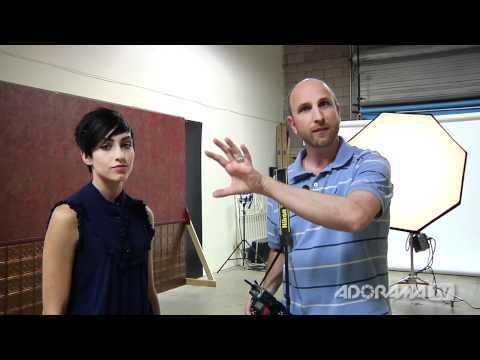 whats the difference btwn using a larger flash or enlarging ur flash using a modifyer? also stephen says "A possible reason the light (fall)off appears to be more severe by moving the light source closer to the subject'' i dont understand according to the inverse square law and the link u posted moving the lightsource closer does make it falloff faster! Stephen, I read the link, which gave me a deeper understanding of the inverse square law, but did not directly address My question. are you trying to say that when you spread the light source (irradiance) out by making it larger, you weaken the light reaching the subject (illuminance) ? If we take the equation from the URL again, suppose your subject is "r" units away from the light, the light intensity on the person is I, as shown in the diagram. If I double the source power, from S to 2*S, and keep my subject at r, then the light intensity on the subject is 2*I. You will not get the same exposure, because now there is more light on the subject. Shulim interpreted my comment incorrectly. I didn't say anything about the exposure. Naftoli asks what the difference is between a larger flash (unmodified) or enlarging the flash with a modifier. That depends on the power output of the flash. If the unmodified large flash has a power output of I, then the intensity leaving the flash is I. If the other flash unit has a power output of I, but it hits a baffle in the softbox that reduces the power by a stop, then the actual light leaving the softbox is less than I. You can calculate the light falloff based on those two scenarios. I found another link that talks about the inverse square law with a less mathematical perspective that might make more sense to everybody. Stephen, I understand your point now. however, it seems you are not understanding my question. my question, at the beginning of the thread, was not "does flashpower affect falloff." rather, my question was "does flash Size affect falloff." if you go back and reread my first post, you'll see that. Going by the equation I linked to, flash size would change the source's surface area. This, in turn, would change the degree of light intensity leaving the source, so this would affect light falloff. EDIT: My original thought experiment with two SB-900 units was bad. A diffuser takes away the light intensity, so that isn't a good test case. This one is a better explanation. For example, I think one could test this approximately by taking two light sources that can output the same flash power. One light source has a smaller flash head than the other. This would roughly approximate the difference in surface area between the two sources. Have the first flash unit fire bare at a subject (i.e teddy bear). Then, have the second unit fire at the test subject. The flash with the large flash head should have a lower starting intensity, which should cause the test subject to look less bright (underexposed) compared to the other. If i use a modifier on my speedlight, correctly exposing my subject, will the background be darker than if i would use bare flash, also correctly exposing my subject? Theoretically, the background will be darker with the flash using the modifier, because the amount of light leaving that speedlight is now less than the amount of light leaving the bare speedlight. Hi Shulim. The laws of physics apply equally to bare flash, umbrellas and soft boxes, so the answer to the original question is no, the light falloff will not be faster because the light source is larger. In the last paragraph you said "when you increase the APPARENT size of the light by bringing it closer to the subject, the falloff is faster". Yes it will be... not because the light source is larger but BECAUSE you moved it closer to the subject (and presumably made another adjustment to ensure the subject was still correctly lit). That's why, if you're taking a group shot, it's better to have the light source further away and use more power (less fall off) so there's more chance of everyone being reasonably well exposed. Allen, you answered my question. thank you. according to you, if I'm shooting a circle of dancers with on camera flash, trying to expose for the bride in the center without severely over exposing the people near me and under exposing the people far away from me, using bare flash will not give me a wider range of properly exposed area than using a softbox (with power compensated for the softbox). 1. Light fall off - the greater the flash-to-subject distance the less fall off there will be. 2. On- or off-camera flash - greater directional flexibility with the light off the camera. 3. Soft box or umbrella (off-camera) - larger apparent light source - less harsh light and softer shadows than direct bare flash. As in all aspects of photography, there are compromises. The power of your flash and size of the room will dictate how far away you can position your light. The closer you position a soft box or umbrella, the softer the light but the darker the background will be. It's evident that I totally did not understand Shulim's questions. For that, I am sorry. I was answering from the standpoint of the light source's starting intensity. I was not addressing the light falloff, which was part of my misreading of the question. Allen did answer my first question at the beginning of the thread. he said that the light size does not affect the falloff. I understood his reasoning as follows: no matter how large the light is, if there is sufficient light hitting the subject, the area directly behind the subject will get the same amount of light, regardless of the size of the light. that's because the same number of photons are hitting that area. EDIT: This post does not answer Shulim's question above. It was to explain where my misunderstood answer came from. I just talked to some math-oriented friends about this problem. This does not talk about light falloff, just the light intensity itself. This was where I was coming from, and as a result, not answering Shulim's question. Suppose you took a picture of a two-inch 100 Watt light bulb from 10 meters and then compared it to a picture of a two-feet 100 Watt light bulb from 10 meters away. The picture of the two-foot 100 Watt light bulb would appear less bright, because of the lower energy density. If the pictures were of the light bulbs only 1 meter way, the bulbs will look close to the same brightness, since at a close distance, you haven't lost a lot of light yet. Likewise, if you were comparing a two-inch light bulb with a three-inch light bulb, there isn't much difference in brightness for a closer distance away from them. I'll use your example to better explain my question, because I don't think you've answered it. if you took a picture of a two-inch 100 watt bulb at ten meters, and another picture of a 20-inch 1000 watt bulb from ten meters, the bulbs will look equally bright. this is because we compensated for the increased size with increased brightness. the numbers aren't exact, but you get the point. now, I take two photos of Newt Gingrich being illuminated by each of these bulbs separately, and adjust my shutter, aperture, and ISO until Newt is properly exposed, ten meters away from the lights. Both photos will give me the same exposure at the same settings. assuming I'm not mistaken so far, here is my question. if I move Newt another ten meters away from the light, opening my shutter speed two stops to compensate for the doubled distance, ( as per the inverse square law), will my settings still be the same no matter which light I use? or will the larger light fall off faster, forcing me to raise my iso when using the larger light? I wasn't answering your question. I was explaining why I answered your original question incorrectly. I was thinking about a completely different aspect of the lighting. Concerning your question, if both light sources are emitting the same light intensity/brightness, then the light falloff for both is the same. To compensate the loss of brightness for putting Newt further back for either bulb, you increased the shutter speed by two stops to keep him properly exposed. Since you already corrected Newt's exposure via the shutter speed, you don't need to raise the ISO for the larger bulb. that's true. what would be a better way to test this? I asked a question about the Inverse Square Law at POTN forums. I watched this video on it and it explains this in feet. I asked how would I explain this using the metric measuring system. You can't use centimetres because those units are too small. Next is meters. Using standard measurement 1 foot to the light source = full power. 2 feet from the light source (squared) = 1/4 power. Using metric measurement one meter to the light source = full power. 2 meters from the light source (squared) = 1/4 power. As you can see there is a discrepancy. At 2 meters or 6.5 feet the light is at 1/4 power using the metric system. Using standard measurement system at 2 feet the light is at 1/4 as well. One is 6.5 feet and one is 2 feet. ?????? So my question was what is the correct measurement system to use since most of the world uses the metric system and I see most explanations in standard. Here was an answer from one of the more knowledgeable people there. "One thing that you may have completely missed is that the inverse square law is based on a theoretical point source of light that emanates light in all directions. Most of our photographic lighting equipment does not act light a point source of light. The larger the effective area of the light source, the less the light from that source follows the inverse square law. When using larger softboxes and umbrellas, the fall-off of light relative to distance from the source is a lot less than when using a bare Speedlite, for example." So technically the explanation Mark Wallace gives (in the video) is not entirely correct. He should have used "units" instead of feet, later stating the unit length is dependant on the size of light source, intensity, etc. That might throw more people off so feet was just simpler to use. So yes, size of the light source does make a difference, however there are other factors as well. Now place a large softbox on the light and change the power so u get f 8 at 5 ft again, according to the inverse square law if we were to now meter at 10 feet with this setup would get a reading of F4 just like we did in the previous example. I think one important point in the article is the reference to the virtual light source. I’m inferring from this that any modifier which produces a more focused beam of light will move the virtual source behind the actual source and anything used to make the light more diffuse will move the virtual source forward. Presumably, if you’re going to be taking measurements, you would start from the virtual source – wherever that is! For us mere mortals, the Adorama video that Mark Wallace presented works well enough. That was my whole point about this Naftoli. I know now that the inverse square law does not work in feet or meters but the video I posted and everything else I have read about it in the world of photography talks about it in feet, which is misleading. That made me wonder how you would explain that using the metric system. You have to measure it in units. The unit length is dependant in the size, intensity, etc of the light source. You would need a lab and specialized equipment to do this so no one would actually do it. It just gives you an idea of how falloff works. I'll have to get back to you about the part where falloff is less with a larger lightsource. That was the way it was explained to me in my previous post. There were no details. Here are two answers I got. I'm not a physicist so I'm having a little trouble understanding this but I believe it. With an 'infinite plane' source of light, it falls off according to Inverse Linear rather than Inverse Square. With a large source, it is like an infinite plane when within about 2*largest dimension and farther from that it starts to begin obeying Inverse Square increasingly. The inverse linear fall off is for an infinitely long light source, for example, an infinitely long fluorescent tube light. If the light source is an infinite planar light source, the light intensity will remain constant no matter what the distance is. Then ultimately, size does not affect the rate of light fall off, for the small light sources we have. Zenon said: Using standard measurement 1 foot to the light source = full power. 2 feet from the light source (squared) = 1/4 power. The standard for distance / length that you use (ie, feet vs meters), does NOT affect the inverse square law. This is built on ratios. If you measure 1 meter away from the light source as your reference point for "full power", then 2 meters away = 1/4 power. Now you HAVE to keep in mind that your two reference points there will have different intensities of light, compared to each other. After all, you're at different distances from the light source. But in terms of the ratios, this holds true. At some level this discussion *is* interesting, but on a practical level it has little to do with how awesome a photo is. - the size of the light source has no influence on light fall off. I see what you are saying about feet/meters and ratios. That is just basic math. There is a significant difference with meters and feet, but then again who is actually going to measure that. As long as a person understands it. All these physics equations are based on theoretical point sources or infinite planes, which does not happen in real life at all. A physicist can probably determine what a more accurate equation is for our real-life scenarios are, but Neil is right that at the end of the day, is the photo great? Even though the equation says "the light intensity is X at this distance with these settings," people's tastes and preferences are not discrete single values. You could take a photo with a range of exposure and lighting settings, and the photos would all be appealing. Naftoli .. then you have homework to do, and come back and tell us. If you put on that Stofen modifier to make your hot-shoe flash larger, adjusting the power to keep the exposure correct, you are creating a larger light source of equal power. Perhaps this is the same as if you had moved the same flash a bit closer to the subject. By adding a modifier, you'd be changing the actual size; by moving the bare flash closer, you'd be changing the apparent size. So if you think of it this way: If you had moved your flash closer, changing your APPARENT size, your falloff would be faster. So if you add a modifier, changing your ACTUAL size, your falloff should also be faster! But does falloff really depend on size? No! Falloff "speed" is really just another way of saying "amount of power!" When you put your flash closer to the subject, you lower the power, so of course your falloff is faster! If you put it further from your subject, you raise your power to compensate, and that makes the falloff slower - because a more powerful light can travel further! Well I got to make a call on the Stofen making the light source larger. It is basically the same size as the flash. The Stofen's job is to spray some of the light all over the place from the sides hoping it bounces off something and is redirected to the subject. That is why it is called an omnibounce. The only reason I mentioned it is so someone does not think the Stofen is a larger light source. Your explanation using a 4" by 6" diffuser and a 2' by 4' diffuser would be more sound but I know what you were getting at. Hopefully I did not offend you. That is why I don't use the Stofen, GF lightshpere or any of those devices. They work in the right conditions but I like to control the bounce. Each to his own.